The team, reporting their findings in Nature, hope that transplanting thousands of liver buds could reverse liver failure. Experts welcomed the findings, describing them as “exciting”. Scientists around the world are trying to grow organs in the lab to overcome a shortage of organ donors. Grow your ownThe team at the Yokohama City University were reproducing the earliest stages of liver development – similar to that in an embryo. They had mixed three types of cells – two types of stem cells and material taken from the umbilical cord. Unexpectedly, the cells began to organise themselves and appeared to curl up to form a liver bud. These buds were transplanted into mice, where they hooked themselves up with the blood supply and began to function as little livers. The transplants increased the lifespan of mice with liver failure. 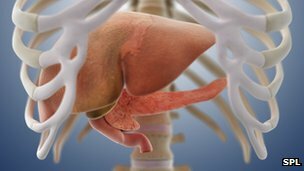 Prof Takanori Takebe said: “We just simply mixed three cell types and found that they unexpectedly self-organise to form a three-dimensional liver bud – this is a rudimentary liver. In regenerative medicine there are four levels of complexity: flat structures such as skin; tubessuch as blood vessels; hollow organs such as the bladder; and solid organs such as the kidney, heart and liver. The buds are 4-5mm in length but the researchers say they would need to develop buds that are much smaller and could be injected into the blood. The buds would not grow to be a whole new liver, but would embed themselves in the failing one and restore it. Dr Varuna Aluvihare, a liver transplant physician at King’s College Hospital in London, told BBC News: “This a great piece of work and as a proof of concept, very interesting. He said the liver was very damaged in chronic liver disease so there were still questions about where the buds were transplanted and how they would function. The risk of a tumour developing after the transplant would also need to be assessed. Dr Dusko Ilic, a stem cell scientist at King’s College London, said: “The strategy is very promising, and represents a huge step forward. Prof Chris Mason, the chair of regenerative medicine at University College London, said there might be more immediate benefits for drug testing. New medicines can be toxic to the human liver in a way which does not show up in animal tests. He said using liver buds might be a better way to test for toxicity.